A couple of weekends ago, I attended the lovely #BloggersBall hosted by Scarlett London, which is a bloggers event full of a variety of different brands. One of the brands at the event was Vatika Naturals, I had a lovely chat with the people on the stand and they were very kind to give me samples of their Argan Oil Shampoo & Conditioner. Vatika Naturals hair care products provide natural nourishment to hair, for a healthy feeling, glow and look. Have a specific hair problem? There is a hair care product for your every need: dullness, frizz, dandruff, hair loss, damage or dehydration (you name it, they have it). They have a variety of different ranges: Olive, Almond, Coconut, Cactus, Lemon, Egg & Honey, Black Seed, Argan, Garlic, Acacia and Henna. Being a big lover of all things beauty related and especially anything to do with Argan Oil, I was very excited to put their Shampoo & Conditioner to the test. The Moroccan Argan range is for adding softness and shine to dull, lifeless hair, which is exactly what my hair was in dire need of. The Argan nut extracts add moisture to hair and scalp, restoring softness and creating a healthy glow. I have been trying the combo ever since and am loving the results. 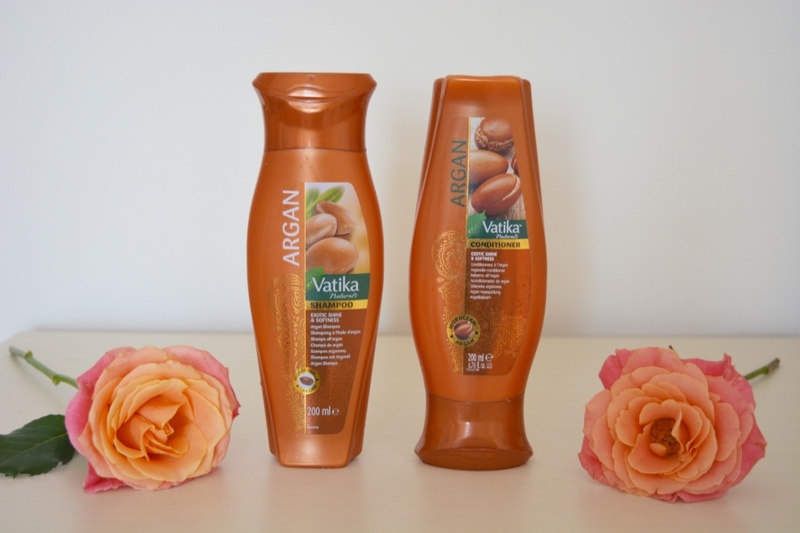 The Vatika Argan Exotic Shine Shampoo is very moisturising, perfect to hydrate both hair and scalp. It lathers really well, meaning you aren't using twice the amount to wash your hair. Especially as I have quite long hair, I don't want to be using a whole bottle of shampoo in one go and my hair feels so much cleaner/fresh/happy afterwards. I then follow it up with the Vatika Argan Exotic Shine and Softness Conditioner, which enhances softness and adds a lovely shine to hair. The longer you leave it on your hair, the more hydration and nourishment goes into it. Vatika recommends leaving it on for 3-5 minutes and to let it all the goodness sink in. The texture of the Shampoo & Conditioner is perfect, not too runny but not to thick either that it cakes your hair and feels like it can't breathe. The Shampoo & Conditioner both cost £2.99 and that is an absolute bargain, as they are such great quality products. I have been very impressed by how good the Vatika products are, I have tried so many different hair care products over the years and these are way better than some mainstreams brands I have used, such as Herbal Essence, Head and Shoulders, and Aussie to name a few. Both products smell incredible and leave my hair with a divine scent, I am obsessed with their hair care products and will definitely be buying more from their ranges. I loved trying out Vatika Naturals hair care products and am so glad I met them at #BloggersBall, I couldn't recommend the brand more and look forward to discovering more from them.